Want to make your home feel even more festive? Just choose these maple trees! It’s November and in a few weeks, we’ll all be celebrating Thanksgiving, one of the biggest holidays all year and one of the high points of the fall season. Want to make your home feel even more festive? Just choose these maple trees! Red maple may be one of the most notable of all maple trees: that vibrant red is a sure sign it’s fall, after all. But sometimes the leaves of a red maple tree can also be yellow. Did you know that these trees are also sometimes called “swamp maples”? Despite what you may think, they aren’t always found in swamps. So, to make the most of these eye-catching colors, you should choose the Autumn Blaze or the Red Sunset; Autumn Blaze will provide the most dependable array of colors year after year, while the Red Sunset can grow up to 50 feet high! Do you love maple syrup? Then you can thank sugar maple trees. If you choose these trees, make sure your yard is maintained and drained often, and either gets the maximum exposure of sunlight possible or even just a portion of that sunlight. In return, you’ll get a tree that is at least 80 feet high and feature colors like yellow, orange, and red. You may think that moosewood is a strange name for a tree. 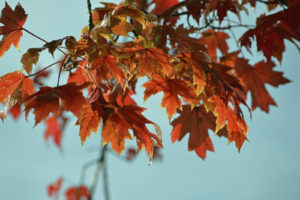 These may not be as well known when compared to the two other maple trees we’ve mentioned, but that doesn’t mean you should overlook them. Why is it called moosewood? It’s a favorite treat for moose, as well as other forest-dwellers such as rabbits, beavers, and porcupines. This tree is also smaller than its counterparts, since it’ll only reach about 30 feet. During the fall, you’ll see a pleasant yellow color. Be on the lookout for moosewood’s most common variant, known as striped maple. Striped maples present vertical white stripes on its bark while it’s still young and is another eye-popping choice. Nelson Tree Specialist provides specialty arborist services, tree crane services, tree care services, and dead tree removal services. We are well known for our top-notch skills and professionalism. We are members of the International Society of Arboriculture and we are considered certified arborists. We are also an accredited business through the Better Business Bureau and we have great reviews through Angie’s List. To find out how we can help your trees, whether they are exotic and strange or normal and plan, give us a call at (301) 854-2218 (Washington, D.C.) or (202) 909-5662 (Baltimore) or visit us online. For more interesting tree facts and tips, follow us on social media on Facebook, Twitter, and Google+. This entry was posted on Friday, November 3rd, 2017 at 4:04 pm. Both comments and pings are currently closed.